So writing up the pattern is slow going, like always. 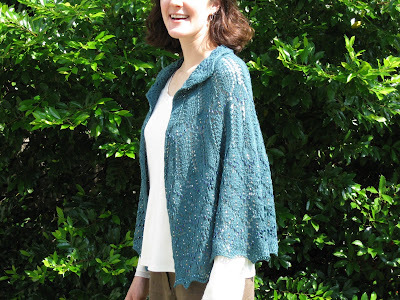 Once I get it finished, I was planning to charge for it, but I have a special offer - you can have an advanced copy for free if you'll knit it up and help me as a volunteer editor. Think about it . . . . 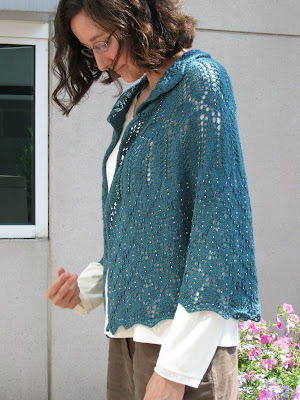 Okay, more ideas for the peacock - what if you knit it all in Bare and then dyed it to look like the peacock? I was thinking you'd mix up the dye pretty thick and paint it on with smallish brushes. Living here in the south it gets so hot I was thinking do this outside on a summer day between 2 black garbage bags - let Mother Nature be your microwave. And, I want to reward my model and design something just for her. Right now I'm thinking something in an earth tone (Gloss in Parsley or Cosmos) with 2 larger panels of a twirling vine with leaves with beads in them and 3 smaller openwork panels on the sides and center. The leaf panels would be reverse st. st. and the vines and leaves would be st. st. traveling patterns. Not hard, but I'm wondering if I can design a traveling stitch that moves in a complete circle and have it come out looking like something. Time for swatches. Projects are like hydras. You dispatch one and 3 more grow from the stump. But that's why I started this blog, so I could always find my "notebook" of ideas . . . . It's done, I thought it never would be but . . .
Once again, my lovely coworker was kind enough to give me 3 minutes of her time to make my knitting look good. I'm thinking I need to take pictures of other body types, too, I feel like I'm cheating using someone who just naturally looks like a supermodel. I took this first picture on my horrible, messy desk so you could get an idea of the size of the finished piece - all my other pictures show it all crammed onto needles. Pattern to follow as soon as I get it finished. Hope everyone had a good weekend. It's been brutally hot here, so we watched a bunch of movies and hid indoors this weekend. The Peacock - I'm finishing it tonight (dang it) and for the edge right before binding off, I'm doing a plain round with beads every other stitch. This row has taken nearly an hour. 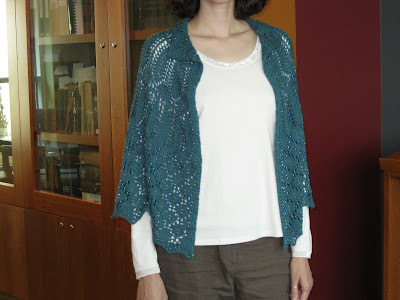 I think this will actually be a lovely little capelet, but most folks will skip and cut way back on the beads. But hey, this is me and if it's worth doing, it's worth overdoing right? Anyway, pictures on a live model soon, pattern to follow and hopefully some less boring blogging as I'll be freed up to do something (anything) else. Loading my lame pictures at lightning speed! Okay, still the colors on the Peacock are much brighter and more diverse than what shows here, but I'm taking these so you can see the pattern. Does it look like a peacock tail to anyone else? God it's a lot of knitting if I come to find out it looks dumb. 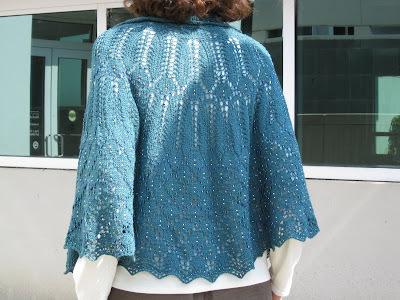 At the very bottom you can see the beginnings of Putnam's wedding stole - I designed it after talking to a friend of mine about what she's knitting for a friend of her's for a wedding. 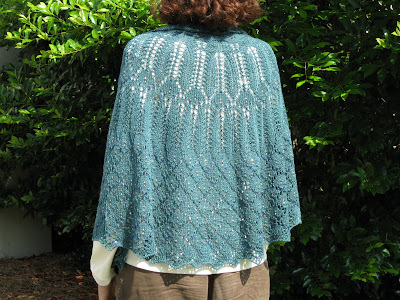 Planning to charge $5 for the Peacock pattern once it's done, but I'll probably make the wedding stole free or only a dollar or 2 - I mean, if you are going to slog through knitting something in lace weight, you oughtta get the discount. Hope everyone had a nice weekend. Our new dishwasher resulted in a chip in our laminate countertop. We're now flirting with replacing the countertops, but as the spouse rightly points out, they'd just rip the wallpaper replacing the countertop so we'd have to do that . . . . It's like a giant kitten has started playing the yarnball of our lives. Okay, my wrist is basically all better, so knitting is now fun not painful, but in the meantime I've been diverted by . . . .
Amazing, the way life goes. So while I had planned to show a snap of the tiny little lace with clear sparkly beads I've been working on (which is insanely slow going, I mean there is an intimidation factor to a ball of lace weight yarn that's crazy, you knit and knit and the ball doesn't shrink one bit! ), but instead I'll go wash 2 days worth of dishes. Ah, college memories . . . Sorry, first picture had to be taken close up, so it's fuzzy, but I was trying out 4 different colors of beads. You can basically get the idea. I'm going with the top sparkly ones. I was thinking of doing the outer frame in this leaf pattern and the inside window in the diamonds with a scalloped edging. Input? Is there too much contrast between the geometric of the diamonds and the natural shape of the leaves? 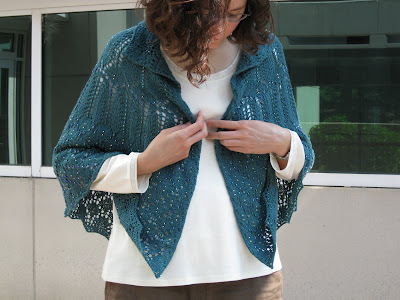 I'll do another swatch with the patterns arranged more like they would be in the final shawl. Planning on doing a simple rectangle for this one, but again, input? Partly that's because we still don't have a home PC tho' that should be fixed this weekend. That's also why I haven't been posting. Or partly why. I ran out of beads for the Peacock, so now that's on hold. I've started doing some swatches for a wedding shawl I have in mind, lace weight and very sparing on beads, which I'm excited about but because my wrist is still pretty jacked up, knitting so slow (if it happens at all). I'm also doing my usual thing of having too many projects going at once so no one things makes much progress so no pictures and not much to tell. So, here's a random thought for Friday. Listening to NPR this morning, I heard a piece "Larger Populations Triggered Stone Age Learning". It's very short and worth a look. I found it pretty interesting and it got me thinking about how I learn (or fail to learn, is more often the case) in groups and by myself. My learning pattern, like many things about my life, seems to work best when it comes in various phases. I do something in a group, get lots of ideas, but then I need time alone for things to germinate. Then I can take my ideas which have now grown some in the shelter of solitude back to the group for use or adaption for others. This made me think about Ravelry and this blog. I wanted to design patterns for the longest time, but never made any headway. 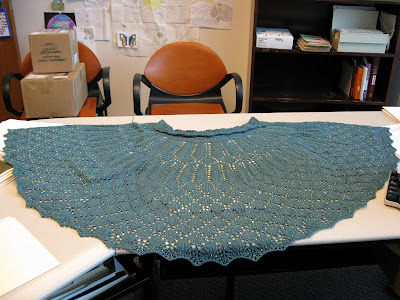 Ravelry provided me with large group setting needed for my ideas and motivation to bloom, exposure not just to the amazing variety of ideas and creative solutions that others have, but the in-your-face evidence that I could actually do it. 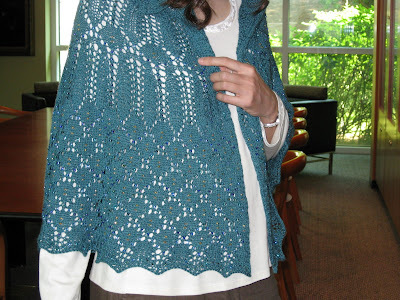 Ravelry pulled me out of my knitting Stone Age, perhaps? It's Friday, I guess I'm willing to post this tangent. Okay, at the end of last week my mom came to visit. Which is, like all mom visits, kind of nice and kind of stressful. Yay, house is clean; even more yay, she's gone home. And I messed up my right arm. I don't know what I did, but when I move my fingers on my right hand, I can feel the tendons grind. Looks like I might have whacked it hard enough to bleed under the skin or something, but I would have thought I'd have remembered doing something that a.) stupid b.) painful. Anyhoo, not very pleasant, and I'm right handed. Typing is okay, driving (shifting) hurts, turning keys in the ignition or unlocking a door is fiery painful. My poor spouse has the flu (fever, chills, awfulness) and our neighbors dogs barked all last night keeping him awake. And, on Friday, he lost a large filling, so now we have a dentist appt. tomorrow at 8am. He really hates the dentist. Oh, and finally, our computer died on Saturday. I'm not even going to attempt to post via the PS3, so maybe I'll just take the work laptop home tonight. 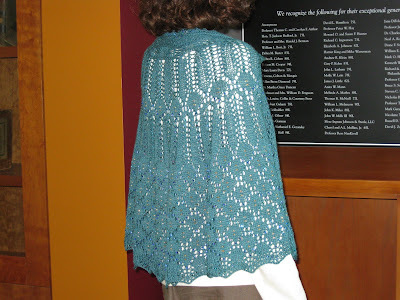 the Peacock Capelet is nearly done. More pictures soon.